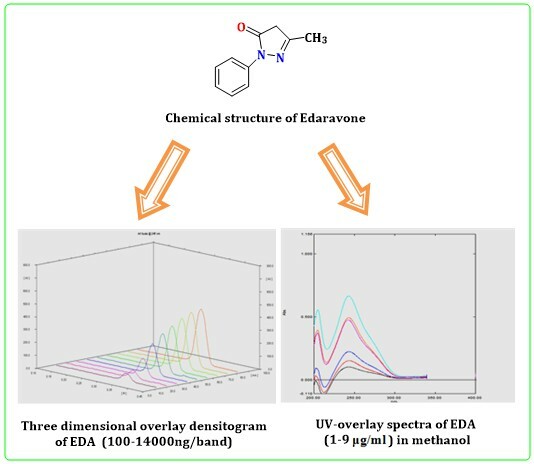 An accurate, sensitive, reproducible and precise stability indicating thin layer chromatographic method and UV-Visible spectroscopic method was established for the amelioration and validation of neuroprotective agent edaravone in bulk and its pharmaceutical dosage form. Edaravone injection is used to treat amyotrophic lateral sclerosis (ALS, Lou Gehrig's disease; a condition in which the nerves that control muscle movement slowly die, causing the muscles to shrink and weaken). Edaravone injection is in a class of medications called antioxidants. The high Performance thin layer chromatographic method was developed with proposed chromatographic condition with mobile phase containing n-Hexane: ethyl acetate (7:3, v/v). Accomplishment of UV–Visible spectroscopic determination was done at wavelength maxima of 245 nm using methanol as a solvent. The linearities were in the range of 1-9 µg/ml for UV-Visible spectroscopic method and 100-1400 ng/band for TLC method, respectively. Validation of proposed method has been accomplished with respect to linearity, accuracy, precision, specificity and robustness. For acid and alkali hydrolysis, chemical oxidation, dry heat degradation and photolytic degradation conditions were performed using stock solution of EDA, and quantification which has been achieved by proposed TLC method. Owing to sensitivity, promptness and accuracy of methods, we rely on both intended methods which will be useful for the regular quality control analysis and quantification of drug in bulk and pharmaceutical dosage form.